Trucks made by Peterbilt Motors Co. are using the system to haul commercial cargo along the Interstate 10 corridor in Arizona. Denton, Texas-based Peterbilt is a unit of Paccar Inc.
“Intensive training of autonomous vehicle software is critical to the success of all autonomous vehicles but even more so for the Class 8 tractor-trailers that haul freight 24/7 on our highways. It can take a football field, or 100 meters, to stop a fully loaded truck traveling at highway speeds of 65 miles per hour, which means our software must look into the future [and] recognize and make informed decisions about any situation it encounters,” said Xiaodi Hou, co-founder and chief technology officer at TuSimple. 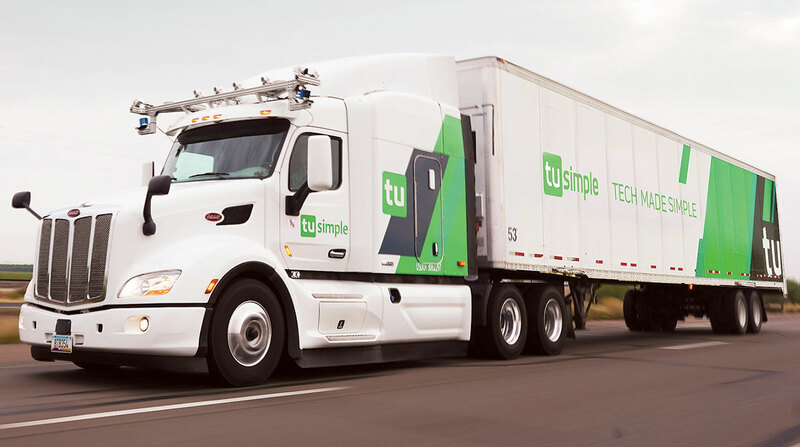 To achieve the perception range, TuSimple spent two years developing the deep learning algorithms that are the instructions used to help the perception system understand terabytes of data created per vehicle every day. TuSimple turned to Amazon Web Services, a subsidiary of Amazon.com that provides on-demand cloud computing platforms, to support the company’s development process, relying on Amazon Web Services’ machine learning expertise and nearly unlimited computing and storage capabilities. TuSimple was founded in 2015 with headquarters in San Diego and Beijing. It has expanded to a new 50,000-square-foot production facility in Tucson, Ariz., to house its fleet of Peterbilt trucks. Further plans for expansion call for adding 500 new jobs across a variety of fields ranging from engineering and autonomous truck driving to office management. The company will also expand its autonomous fleet to 200 trucks in the United States by 2019.